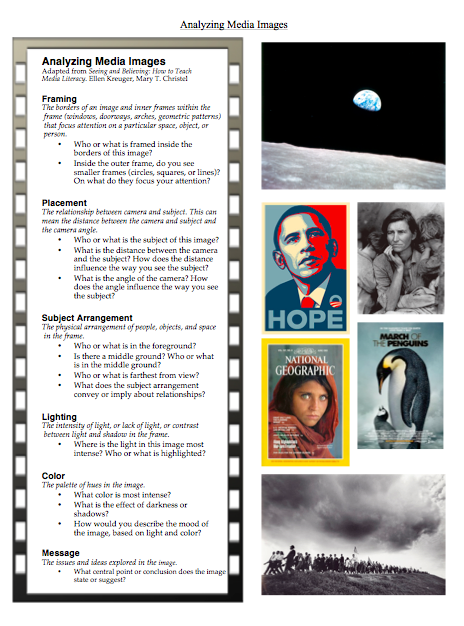 Imagine a classroom where neither words nor images are considered "supplementary" texts and where students apply the principles of visual compositions to their own. Framing refers to the subject, who or what viewers see, in an image, as well as what we don't see -- the ways in which the camera limits the viewer's field of vision. Placement refers to the position -- the distance and the angle -- of the camera in relation to the subject. Subject Arrangement refers to the physical arrangement of people, objects, and background in the frame, and can convey or imply relationships. Lighting refers to the intensity of light, or the lack of light, or the contrast between light and shadow in a frame. Color refers to the palette of hues in the image, and along with lighting, its effects can be manipulated through intensity and contrast. Light and color can draw the viewer's eye to a particular place in the frame; together, they can convey the mood of an image. Click here for a user-friendly handout of the Analyzing Media Images bookmark.